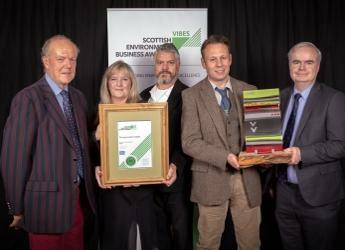 Professor Colin Campbell, Chief Executive of the Institute, commented: “We are proud to have been recognised at this year’s VIBES – Scottish Environment Business Awards in the adaptation to climate change category. "Receiving a VIBES Award is a real testament to the hard work and commitment from everyone at the Institute with our partners doing whatever we can to reduce our impact on the environment and deliver a sustainable future. "The Awards provide a great spotlight on good practice that improves operations as well as benefitting the environment, and we hope others are inspired to make their own positive changes." Now in their 19th year, the VIBES awards urge Scotland’s businesses to challenge their everyday working practices and embrace the economic opportunity of sustainability. The Adaptation to Climate Change judging panel included David Balmford, Denise Main (both from SEPA) and Ellen Eyles (Scottish Water). The judges visited the Institute’s Invergowrie site in September to find out more about work to develop barley varieties and farming systems to cope with climate change. They also visited Balruddery Farm to learn about our innovative Magic Margins and the Centre for Sustainable Cropping. On announcing this year’s finalists, Bob Downes, chair of SEPA and head of the VIBES judging panel, said: “The VIBES – Scottish Environment Business Awards are a great chance to recognise business leadership in sustainable environmental investment. This is at the core of SEPA’s One Planet Prosperity regulatory strategy. New approaches for delivering environmental improvements provide businesses with opportunities to enhance their sustainability and economic performance. “The Awards celebrate businesses which are already stepping up to this challenge and are leading by example and are an excellent opportunity to recognise and reward these companies for going beyond ‘business as usual’ and driving sustainable growth through innovation. It is very encouraging to see so many of Scotland’s businesses leading the way and making a difference which will not only support the environment but also protect their bottom line."